I love actress, writer and comedian Tina Fey, so naturally I loved reading this book. There are many things I admire about Tina: her talent as a comedian and writer; her nerdiness; and her ability to poke fun of herself. I used to love watching her on ‘Saturday Night Live’ and have watched all the seasons of ’30 Rock’. I’m just surprised it took me so long to read this book. 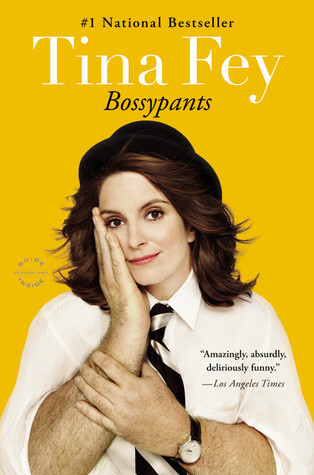 I wanted to read Bossypants to find out more about how Tina Fey became a comedy writer and to read behind-the-scene stories about her TV shows. (She didn’t go into as much detail about this as I would have liked). But what I did learn is that she can make any story from her past totally hilarious to read. From her dorky growing-up phase to creating and starring in her own hit TV show, to becoming a mum, this book is hilarious. There’s also a theme running through this book – girl/woman power. Tina writes about making it in a male-dominated part of show biz. She doesn’t do this in a ‘bra burning way’, more of a determined way where at times she had to fight for the sisterhood to be heard. I really hope that Tina writes another book again soon. This was fantastic! And can’t wait to see her co-host The Golden Globes.